perjuangan untuk keadilan, kesaksamaan dan kebenaran. memusnahkan Kebenaran dan Cahaya ini. Selepas kelahiran Yesus, orang-orang majus dari Timur ingin sujud menyembah kepadanya. Dalam perjalanan, mereka bertemu Herod. Setelah diberitahu mengenai kelahiran Yesus, Herod memanggil orang-orang majus itu dan memberitahu mereka untuk "pergi dan cari dengan teliti anak itu. Sebaik sahaja anda jumpa Dia, laporkan kepada saya, supaya akupun boleh datang menyembah Dia” (Matius 2:8). Setelah diberi amaran dalam mimpi, orang majus tersebut tidak kembali kepada Herod setelah melihat Yesus, tetapi kembali ke negara asal mereka melalui laluan lain (Matius 2:12). Setelah menyedari dia telah dilepasi oleh orang-orang majus itu, Herod memerintahkan supaya semua bayi lelaki yang berumur 2 tahun ke bawah dibunuh. Yesus akhirnya dikhianati dan dibunuh tetapi "Jalan, Kebenaran dan Cahaya" tidak mati kerana pada hari ketiga Yesus bangkit semula memenuhi ramalan Alkitab, mesej utama Paskah dan Harapan. undang. Pemberi maklumat, kumpulan hak-hak asasi, ahli-ahli parlimen, ahli-ahli akademik - tiada yang terkecuali. kebenaran dan keadilan untuk semua yang tertindas" (Mazmur 103:6). mereka seolah-olah kebal tetapi pada akhirnya, mereka sentiasa jatuh - ingatlah sentiasa"
boleh terjadi bila-bila masa sahaja. 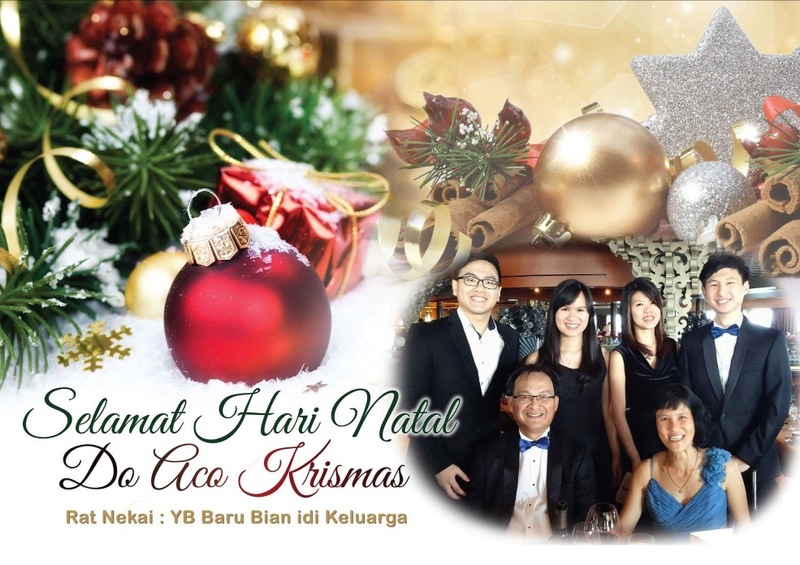 Semoga kita diberkati Allah pada Hari Natal ini dan Selamat Tahun Baru. Thank you for giving me this opportunity to debate on the proposed Budget 2016. I would like to take this opportunity to deliberate a little about the investments that we should seriously look into. In my question on the retrenchment of workers in the oil and gas sector this year, the oral answer we heard this Wednesday was depressing, out of 220 workers retrenched, 219 of them are Sarawakians. This is the single most significant industrial sector in Sarawak, whereby we derived more than one-third of our state’s income, and we are referring to the most prized resources endowed by nature to Sarawak. These 220 workers retrenched are just a fraction of those who are likely to be laid off within the next few months, and even more, if the prices of oil and gas do not improve next year. I am certain that the Labour Department will do a good job to monitor the rationalization exercises of the corporations to ensure that the laws as regard retrenchment are complied with, more particularly the payment of retrenchment benefits. However, retrenchment benefits can never be sufficient compensation. A caring governmentwould do more to protect her rakyat’s rights to work, which is a right to life. We mustundertakes pro-active and strategic roles in the petroleum industry to better protect and safeguard the sustainability of our precious resources and the interests of the state and our people employed in this oil and gas sector. Therefore, when it was revealed that the retrenchment exercise of Shell is linked to Shell Overseas Holding Ltd’s plan adjust its upstream portfolio, to dispose its 51% stake in Shell Refining Co (Federation of Malaya) Bhd or converting its refinery into a terminal for import, export and storage. I would urge the state government to discuss with Shell, to take up the 51% stake in SRC in order that the state can play a constructive including an ownership role in the oil and gas upstream portfolio. On the other hand, to safeguard the livelihood of the workers, the government should talk to Petronas to absorb the 219 said-to-be highly skilled Sarawakian workers laid off recently or to engage Institut Teknologi Petroleum Petronas (INSTEP), the technical training institution owned by Petronas, to provide education, upscale training and skill development for them and others who may be retrenched in this current challenging time, so that they can be deploy into other sectors of the oil and gas industry or play more crucial roles when the prices of oil and gas are up again. Datuk Amar Speaker, Honourable members may ask why should we invest in the oil and gas when the renowned industrial players have scaled down and even changed their portfolio. Firstly, I would like to think that our second motion unanimous approvedin this august Dewan to assert our state rights, which include the affirmation to preserve and safeguard our state’s territorial integrity, will inevitably and significantly improve our position to bargain and negotiate for better returns and control over petroleum development projects which are to be undertaken within our territorial boundary. Next, I am encouraged to read an article published in a leading digital financial media, called The Street earlier this week, that Warren Buffett has a game plan for the oil and gas industry. I am referring to Warren Edward Buffett of course, the most successful investor and one of the world’s most influential personality. In the latest filing of his main holding company, he has significantly increased its stake in a Canadian-based energy company that specializes in producing synthetic crude oil and another Texas-based processor and transporter of oil and natural gas products, truly living to his most famous quote “Be fearful when others are greedy. Be greedy when others are fearful”, meaning to be prepared to invest in a down market and to "get out" in a soaring market. Peter Lynch, another renowned investment guru had his international investment fund and assets grew from 20 million to 14 billion US dollars in 13 years, beating the Standard & Poor 500 Index benchmark in 11 of those 13 years and had achieved an impressive annual average return of 29%. His oft-quoted advice to investors is to stay on course when hit with recessions or declines, because economies are cyclical and the markets have shown that they will recover. The important thing is to make sure that we are a part of those recoveries! Our state government has better quickly approach Shell for the stake in SRC before they change their mind. However, the most important sector for investment by a government is not in the stock market to make more money. Benjamin Franklin, one of the Founding Fathers of the United States, may not have heard about that Chinese proverb, but the famous polymath, "Renaissance man" or a learned person echoed words to similar effect, that "An investment in knowledge pays the best interest". Benjamin Franklin facilitated many civic organizations and he started the University ofPennsylvania in 1740. The University which is now 375 years old is a world class top university, 18th in the QS world university ranking for 2015-2016. China and US, together with the other world leaders, their countries are great because they have long realized the importance of investing in education of their younger and future generations and they are reaping the handsome rewards. Datuk Amar Speaker, it is true that RM200 million is a huge sum of money, and it is a sizeable financial commitment on the state each year if we are to ask for ownership of Unimas. However, Datuk Amar Speaker, the state budget presented by YAB Chief Minister has shown that we can manage it. Reportedly, we have a budget surplus of RM175 million. With prudent financial management, or if we persist to keep our goose that lays the golden egg, Sacofa Sdn Bhd, its annual income alone will more than make up the balance of the sum to be allocated to Unimas. By the way, Datuk Amar Speaker, my question on the latest development in the disposal of the State Financial Secretary Incorporated’s stake in Sacofa was rejected. The ground for the rejection that the information is available in the public domain is mistaken and erroneous. I have perused the public documents filed by concerned parties over the last 6 months and they are nothing enlightening. There is only the market speculation that the acquiring private corporation is lobbying the state to extend the monopoly of Sacofa as the sole service provider of infrastructural facilities in Sarawak which I respectfully think that it is not in the best interests of the State and all Sarawakians. I would be most grateful if the Honourable Minister concerned will enlighten this august House of this issue that is of immense interests and concerns to all Sarawakians. Coming back to the annual amount of RM200 million needed to maintain Unimas, Datuk Amar Speaker, it amounts to a mere 4 percent of our state budget. I am sure that this is a very small sum, if we do not see it as an expenditure but an investment on our children and the future of Sarawak. For completeness to account for the foresight of Benjamin Franklin and the University of Pennsylvania he facilitated in 1740, the budget for the University of Pennsylvaniain the fiscal year of 2015 is a massive USD7.25 billion, or RM30 billion. And it registered a massive university endowment of USD10.1 billion. The investment into a world class university has its massive rewards and it is of no financial burden to the state at all, or in the long run. Datuk Amar Speaker, I am proud to be in this Honourable Dewan that has passed a motion, which amongst others, emphasized on the needs to regain autonomy in education system and policies which our state of its unique socio-cultural diversity rightfully deserved. Many Honourable members have devoted consideration time debating for it and my studious former classmate and Honourable Member for Demak Laut has in his questions and speech rightly highlighted everyone’s concerns over Unimas’ priority in serving the needs of Sarawak. Datuk Amar Speaker, it is certainly a heavy burden on the federal government to maintain 20 public universities and the less than mediocre support has resulted in the achievement of universities which are mediocre at best. I am hopeful that they will be happy to allow Unimas to be a state-owned government university and I am more than certain that we can enable Unimas to out-perform all its peers in this country and enter the QS World University Ranking within a short time. Surely, it will be more meaningful for our Right Honourable Chief Minister, who will not be complaining, when he is accorded another honourary degree from a Unimas that has gained global prestige. To conclude, I would therefore urge that we realign our investments, prioritising the needs of all Sarawakians, for the future that is a significant fair land Sarawak.